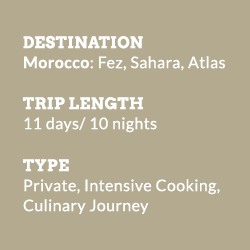 Your 10-day private journey through Morocco is filled with culinary experiences, hands-on cooking classes and unique cultural immersion. Embrace Morocco’s amazing flavours as we travel through high Atlas mountains, sweeping deserts of the Sahara, dramatic gorg-es, rugged coastlines and winding alleyways of ancient medinas and bazaars. This most diverse country of Africa will leave you with a lasting impression on soul and palate. If you prefer to travel at your own pace with our guides, this private trip is for you. Our culinary journeys will immerse you into the local culture and our experts invite you participate in their kitchens and traditions. Min 2 guests. Fez is the most medieval city of the Arab world. It has the best preserved old city and it is famous for its ancient walls. The Medina (old town) “Fes el-Bali” is a UNESCO site and behind its high walls is a magical, medieval city just teeming with life in every one of its 9000 narrow streets. Fes is the cultural and spiritual capital of Morocco and you’ll certainly experience its vibrancy. Through Fez, you can see the soul of the culture alive in the traditional music, ancient places, peo-ple, and everything around you. While other cities are striving to modernise, Fez still preserves its culture, art, food, and everything that makes this city a secret luxury. In Fez, you will step back into the history as there are too many places that are totally worth a visit here. Marrakech is an incredible mix of Arabic, Berber and Moorish culture, spice souks, an-cient medina and glamorous hideaways – spiced with a pinch of French sophistication. Located at the food of the Atlas mountains, this imperial city is noisy and busy as well as fascinating, full of history and beautiful. Barter your way through the souks and marvel at the ancient sights and tombs. Take refuge in the tranquillity of the Majorelle gardens or relax with a cup of mint tea in the courtyard of your beautiful riad. Indulge in your rose scented hammam and watch the sun go down from the rooftops overlooking the city. At night, snack on local delicacies at the famed Jemaa el-Fnaa, UNESCO site, amongst snake charmers and belly dancers. Or, dine on delicious tajine in one of the many chick cush-ion-filled restaurants under a starry sky. From the white peaks of the High Atlas Mountains to the Saharan desert Morocco offers a hugely diverse range of experiences for travelers. This sublime slice of North Africa is richly coloured and patterned as the rugs you can find in the bazaars. The mountains – not just the famous High Atlas but also the Rif and suntanned ranges leading to Saharan oases – offer simple, breathtaking pleas-ures: night skies glistening in the thin air, and views over a fluffy cloudbank from the Tizi n’Test pass. On lower ground, there are rugged coastlines, waterfalls and caves in forested hills, and the mighty desert. Winding our way through the alleys and souks with a Fez food expert. We’ll visit different food souks allowing the chance to try traditional Moroccan street food includ-ing dried meats, milawi, harsha, briwats, spicy sardines, spicy potato cakes, soups, olives and more. At the honey souk we’re you’ll be able to taste an array of delicious wild honeys, discuss their fla-vors and health-giving properties and find out why honey is so important in Moroccan cooking and Islamic culture. We’ll investigate traditional cooking methods by visiting a furnatchi where the water for the com-munal bath house ‘hammam’ is also heated, and a 400 year old ‘furan’ or communal oven and bak-ery. Discover the world of spices and their uses and the secrets of the male-oriented domain of the tea den under the guidance of a culinary leader and story-teller. You might try cooking ‘on-street’. Shop and fill up a terracotta urn ‘tanjia’ to have embedded in the hot ashes of the furnachi for a rich and spicy Moroccan casserole, followed by a tasting tour. Or learn to bake bread in the 400 year old community oven with the baker overseeing your hands-on efforts. Take your hot bread to the honey souk to try it with 8 artisanal wild honeys, aged butter or khlia, spicy dried beef. More than a traditional Moroccan cooking class, this is a complete immersion into the Moroccan culture and family life. The perfect chance to interact with locals and experience a truly unique day hosted by a Moroccan family, preparing food, visiting the souks, baking at the local farran, finishing with a meal that you will all share together in true Moroccan style. This is the perfect opportunity to learn about Morocco’s emerging artisan cheese industry at one of Morocco’s leading boutique frommagerie, situated just outside the town of Immouzer. The private property is one of the first to be officially certified organic in the region and is set against a backdrop of apple and orange orchards with their cheeses supplied exclusively to Moroc-co’s leading luxury hotels & restaurants. Their cheeses are handcrafted from goat and sheep milk, or a combination of the two, using tradi-tional century old Berber methods. The results are mouthwatering with each cheese type reflecting the unique vision of the farm and determination to offer the most amazing tasting experience! Ever wondered how couscous was made in Morocco before the days when factories produced thou-sands of kilos to sell worldwide every day? Meet the women in the Middle Atlas town of Ribat El-Kheir to learn an appreciation for the art and wonderful taste of hand-rolled couscous. The Women’s Association who teach this traditional skill and who also run their bakery is one ex-ample in the town which is creating opportunities and increasing the standard of living for the resi-dents. It is also possible to visit a weaving association overlooking the mountains. Learn the secrets of a good Moroccan couscous while at the same time experiencing traditional ru-ral life. We will roll our own couscous from scratch with the women of the association and then cook and eat it for lunch. After lunch take a walk along the ridge to see the donkey-powered olive press and have mint-tea and an olive oil tasting with the owner. Our hotels during your journey are carefully picked for their outstanding quality, ambience and unique expressions of the region. They are small luxury boutique hotels, sublime retreats, ancient riads and often count as heritage houses. Dates are available year-round upon request with spring and autumn being the most pleasant times to visit. Accommodation can get booked out fast around New Year and Easter. Please keep in mind the Islamic fasting month of Ramadan (5 May – 4 June 2019) and Eid (12 Aug) . During this time, daytime travels and activities may be curtailed or achieved with a noted lack of local enthusiasm. However, to be in the country during this spiritual time, and to witness the happy, festive atmosphere at nighttime, can more than offset any travel inconveniences. 10 nights luxury accommodation, based on double occupancy, private transport and English speaking guide, cooking courses and all excursions, sightseeing, tastings, meals etc as per itinerary. Fez food tour – Souk visit – Kings Palace Ramparts – Sunset cocktails in medina. 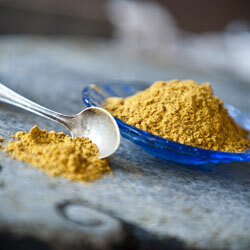 Fez : Shopping at spice market – Hands-on cooking course. Scenic drive through Middle Atlas Mountains– Traditional bread baking at local farm – Regional olive oil tasting – Arrival in Midelt. En route to Sahara – Ziz valley and Efous oasis – Arrive in Erfoud. Erfoud, Rissani & Sahara Desert – Fossil digs – Flamingo lakes – Overnight Camel excursion. Journey from Skoura – Marrakech via Ourzazate & Ait Ben Haddou: UNESCO sites and ancient Kasbahs – High Atlas Mountains – Tiz-n-Tichka pass with breathtaking mountain views. Marrakech guided tour – Mosques and Tombs – dinner in Djmaa el Fna Square. Tanjia cooking class – visit to Hammam – Afternoon excursion to winery & fromagerie. Departure or extend your stay to further explore Marrakech. Note: This itinerary is entirely private and tailor-made thus can be shortened or extended to cater to your needs. Please enquire.